Most of the LED-based lamps that you see on sale today are based on ‘silicon chip’ technology that requires the LEDs to be manufactured in very expensive ‘clean’ rooms. However, a new generation of energy-efficient lighting based on OLED (organic light emitting diode) technology is about to hit the market.While chip LEDs are the ideal solution for applications where you want directed light, such as spotlights, OLEDs promise the other extreme – entire walls that gently and evenly glow with light or even OLED-coated windows that illuminate rooms with simulated daylight when it gets dark.Like ordinary LEDs, OLEDs rely on the same electron/hole phenomenon that occurs in semiconductor materials, yet this time the semiconductor material is not a brittle crystalline inorganic material. It’s an organic substance that can be deposited onto surfaces, theoretically any size or shape, using vacuum-deposition techniques. One day, it may even be possible to produce OLED panels using a roll-to-roll printing process not unlike that used to produce wallpaper. Just image it – wallpapering your home with light.Initially, however, you’re going to find that OLED lighting panels are flat and rigid, encapsulated between thin layers of glass. Why? 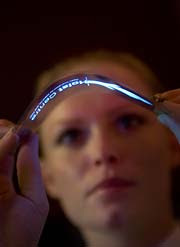 Because OLED materials are rapidly degraded by oxygen and water, which means the current technology needs something as impervious as glass to let the light out but prevent oxygen or water from getting in.